Oil on canvas. 1866. Private collection. 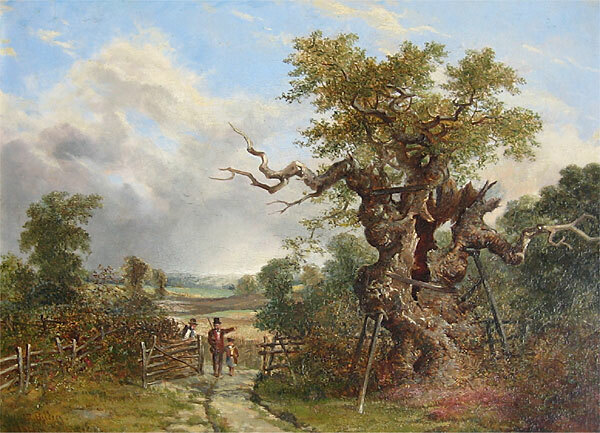 The picture appears to show the Major Oak, a famous tree in Sherwood Forest, Nottinghamshire. We have given it this title as there is no title on the picture. More information about the Major Oak appears on several websites including the Nottinghamshire County Council website and Find the Major Oak. It is remarkable that the 800 year old tree appears to be in better condition today than in the 19th century. A great deal of careful work has been put into its preservation. It is an attractive and dramatic landscape, perhaps influenced by the work of John Constable (1776-1837). 380 mm by 280 mm.